In 1985, Robert Zemeckis became the “talk of the town” when he, along with Universal Studios, released a mainstream summer flick that was simply titled ‘Back to the Future.’ It had teen heart-throb Michael J. Fox, a catchy song by Huey Lewis and The News, and special-effects that were totally ahead of its time. What people expected to be a fun, “popcorn” movie, ended up becoming a fully fledged pop-culture phenomena. And sure, I am a little biased; ‘Back to the Future’ is one of my favorite movies of all time (check out our ‘Top 10 Lists’ link at the top of your page), but I really do think that when it comes to science fiction, humor, excitement, entertainment, and making the perfect ‘time-travel’ movie, ‘Back to the Future’ nails it. Every once in awhile, you’ll get a ‘Groundhog Day’ or ’12 Monkeys’, which give you hope that a good time jumper movie is still possible; but for every good one, there is about 10 bad ones out there; ‘The Time Traveler’s Wife’, ‘Terminator’ 3 and 4, ‘The Time Machine (2002)’, ‘The Butterfly Effect’, ‘Clockstoppers’ (I must abandon my nostalgia and be objective on this one), ‘Bill and Ted’s Excellent Adventure’ (don’t try to prove to me that this is a good movie. It’s garbage. Watch it again, I promise it doesn’t hold up over time), and I could go on… for a while. I get it, I understand that there is the difference between a time travel movie that is serious and one that is a comedy, but goodness, why does your time travel movie have to be eulogy or completely idiotic? ‘Donnie Darko’ makes you want to jump off your own roof, and ‘Hot Tub Time Machine’ makes you want to flee from the theater. It’s the list of sub-par movies above that make you want to look up to the heavens and thank somebody when a movie like ‘Looper’ comes around. 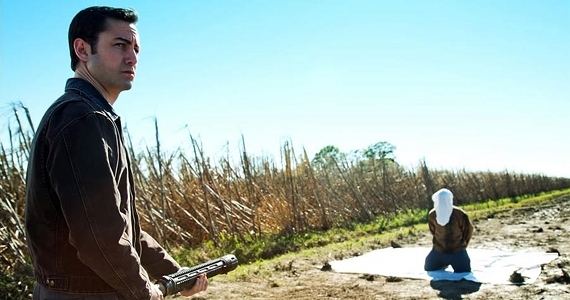 Not only is it a great work of sci-fi, taking a totally different angle on an overdone concept, but ‘Looper’ is also one of the most wildly entertaining, thought provoking, unique, and thrilling movies you can spend your money on. And when I say thrilling, I mean the ‘adrenaline shot to your aortic valve’ kind of thrilling. The film is titled ‘Looper,’ but it is also the profession of our central character. The year is 2044, and Joe (Joseph Gordon-Levitt) is a looper; and what does that mean? Well, here’s where it starts to get complicated. You see, in 2044, time travel has yet to be invented, but in thirty years time travel does exist, and although it is illegal, the mob uses this technology to send their enemies back in time. When their targets arrive, a looper is already waiting for them with a loaded gun, and kills the hooded victims on sight. This is how the racket works if you’re a looper; you kill the victims that are sent from future, receiving payment in bars of silver for every kill, until one day your future-self appears in front of you. Doing what you’re trained to do, you kill the target on sight, effectively killing your future-self. “This is called ‘closing your loop’.” This is how these future mobsters end your contract, making it as though you never existed in the first place. When you ‘close your loop’, you’re given a lottery-sized pay day and an early retirement. You also get 30 more years to live until, of course, you are sent back in time to be killed, by yourself. Our story really gets rolling when our “hero,” Joe, lets his target get away. Normally, this would just be a minor problem, except the man that escaped is Joe, from the future (played wonderfully by Bruce Willis). Now, present Joe is trying to hunt and kill his future self, future Joe is trying to change the future, and Joe’s employers are trying to wipe the both of them, present and future, off the map. Watch future Joe escape! Click here! Sadly, this is really all that I want to summarize about the plot of ‘Looper’. So much of this movie really depends on the element of surprise and experiencing all of the mind-bending twists and turns, and as always, I don’t want to spoil the fun for anyone. Another decision that I think really set this movie apart was the choice to have two separate actors play the same character, the present and future Joe. Although criticized by some, I one-hundred percent support Johnson’s decision to rely on the acting abilities of Gordon-Levitt and Willis to bring this character to life. Using a very clever make-up job, JGL takes on an entirely different face, and an entirely different persona for that matter. In ‘Looper’, Joseph Gordon-Levitt is really pushed to go beyond his usual character and create a frustratingly neutral, and often unlikable young man. The more I think about it, the character of young Joe really establishes the reality of ‘Looper’; the reality that there are no good guys, and there are no bad guys. Every person in this story has their own motives, their own desires that they are desperate to defend. Maybe that’s what makes this film so flippin’ exciting. On the flip-side, Willis’ take on Joe is nothing short of marvelous. He takes the groundwork that his younger co-star has given him, and builds a character that is both determined and sorrowful. In one particular scene, where the two Joeys sit down to chat for the first time, Willis brings the movie to a total halt by being the energy behind a commanding bit of dialogue. In all seriousness, this scene, which take place in a vacant country diner, may be the best thing you watch on a screen this year. Don’t miss it. The best advice I can give you; Go to your local RedBox, Blockbuster, Netflix, or On-Demand provider and check out ‘Looper’ on December 31, when its released on DVD and Blu-Ray. If you hate it, I’ll refund your money myself. Just call my secretary, and they’ll iron out the details. 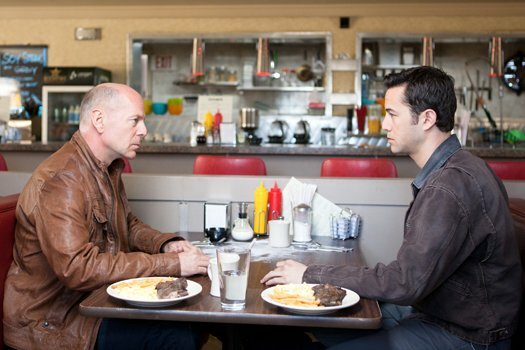 My Note: Looper is as unique as it is entertaining. You’ll want to go back in time just to see it again.